General Information: The Northern Saw-whet Owl is a small owl about the size of an American Robin. They are members of the Strigidae family. 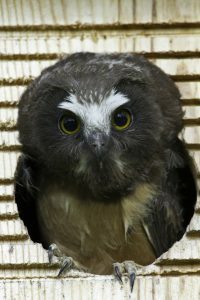 Characteristics/Description: Northern Saw-whet Owl is a charismatic small owl – 7.1 to 8.3 inches in height, with a wing span between 16.5 and 18.9 inches – an owl that will fit in the palm of your hand. Adults are mottled brown with a whitish facial disk and white-spotted head. Their beak is black and their eyes are yellow. Juveniles are dark brown with a cinnamon-colored breast and belly. They have large, rounded heads that lack ear tufts. Preferred Habitat: You’ll only find these owls in the forest, preferring mature forests with an open understory (for foraging). They prefer deciduous trees for nesting and dense conifers for roosting (the better to hide), with riverside habitat nearby. Breeding Season: Breeding season begins mid-March to mid-April, ending in late June. They are generally monogamous, however, if there is sufficient food available the male will mate with more than one female. Males begin calling (incessantly) in late January to attract a mate and to defend its territory. Nest: The females choose the nesting location. They are secondary cavity nesters (nesting in previously excavated holes – think woodpecker hole) in dead snags. They are not known to reuse a nest cavity two years in a row. The nest is located at the bottom of the cavity, and may consist of wood chips, twigs, moss, hair, and small mammal bones or may even be unlined. Nest cavities may be anywhere from 8-60 feet off the ground. The nest hole is generally 3inches wide and 9-18 inches deep. 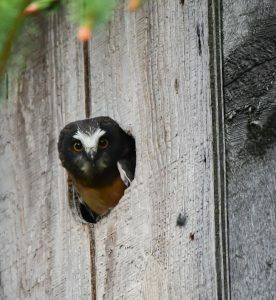 Northern Saw-whet Owls also will use nest boxes (see https://nestwatch.org/learn/all-about-birdhouses/birds/northern-saw-whet-owl/ for plans on how to build a nest box). You might want to consider one for your home, provided you have the right habitat. If you install a nest box it is helpful to lay some wood chips in the bottom. Eggs and Incubation: The female Northern Saw-whet Owl lays between 4-7 eggs (generally 5-6) with a 1 to 3-day interval between each egg, and can have up to two broods per year. The eggs are incubated by the female for 26-29 days. The young hatch in intervals, and are taken care of by the female, although the male brings food to the nest during incubation and brooding. The chicks fledge within three-weeks of hatching at which time the female and male hunt and feed the young. The young are born covered in white down, eyes closed (opening 8-9 days later). They are semi-helpless when born. Fledging: The young leave the nest 27-35 days after hatching. However, they remain near the nest and are feed (primarily by the male) for another four weeks or more. Food Preferences: So what do these birds like to eat? The mostly eat small mammals – mice, shrews, voles, shrew-moles, bats, and the young of chipmunks, squirrels, and gophers. In the Homer area (coastal), they may also eat intertidal invertebrates, such as amphipods and isopods. 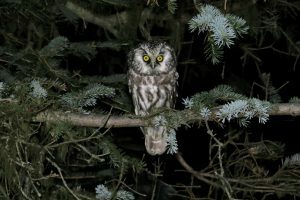 Feeding Methodology: These owls hunt at night (nocturnal), using both sight and sound; hunting hunt from a low perch along the forest edge flying silently and low towards prey. Roosting: These birds roost during the daytime in dense vegetation making them difficult to see even though they are typically just above eye level. 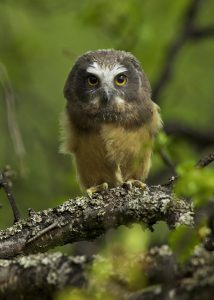 Migration: The Northern Saw-whet Owl is both a resident and a long-distance migrant. They may migrate north/south or in altitude (moving to lower elevations in the winter). Others may remain in the same location year-round. These birds migrate at night using known migration routes across the continent. They are found year-round in Alaska, although their range is quite limited (see range map). This owl winters in a variety of woodland habitats, but may also be found in suburban and urban areas. Spring migration begins late February and continues into May. Fall migration is from late September to December, peaking in October and early November. Call: A rhythmic, repetitive toot, toot. The bird is most vocal before dawn. During the breeding season the male gives this rhythmic song for hours without a break. Threats: Habitat loss due to reduction in mature forests through logging. Climate change. 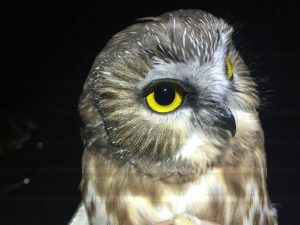 Kachemak Bay Birder Jason Sodergren of Homer Alaska has been banding Northern Saw-whet Owls at his home since 2009. To date, he has captured and banded 1231 of these cute, little owls – many of them juveniles. That is a lot of owls coming through the Homer area. Its name may have come from its call, which has been likened to a saw being sharpened on a whetting stone. Migrating Northern Saw-whet Owls can cross large bodies of water, e.g. the Great Lakes. 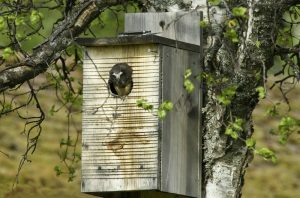 The female keeps a very clean nest, however, once she leaves to roost elsewhere (and prior to the young fledging), the young birds can quickly turn that clean nest box into a typical youngsters’ quarters – messy (layers of feces, pellets, and rotting prey parts). Conservation Status: The Northern Saw-whet Owl is a common species, with an estimated global breeding population around 2.0 million. Only the Southern Appalachian Northern Saw-whet Owl population is listed on the Audubon 2014 State of the Birds Watch List. This population is at risk of becoming threatened or endangered unless conservation actions are undertaken. South Dakota and North Carolina have listed the birds as species of special concern. 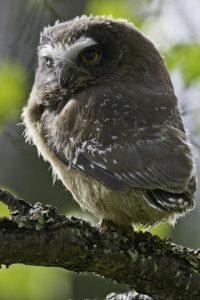 The International Union of Concerned Scientists listed the Northern Saw-whet Owl as a species of least concern, with a declining population trend. The species is not listed on Alaska Audubon’s Alaska WatchList 2017. BirdLife International. 2016. Aegolius acadicus. The IUCN Red List of Threatened Species 2016: e.T22689366A93228694. http://dx.doi.org/10.2305/IUCN.UK.2016-3.RLTS.T22689366A93228694.en. Downloaded on 06 August 2018.
Who Gives a Hoot? Owls, for one.